For this step in the process we wanted to truly understand what our challenge was and assumptions we may have regarding the issue. So for the first part we revisited our goal, which is to help community gardens in food deserts become sustainable, and clarified some key words. A food desert is defined as a census tract area where 33% of the population lives more than a mile away from a grocery store. 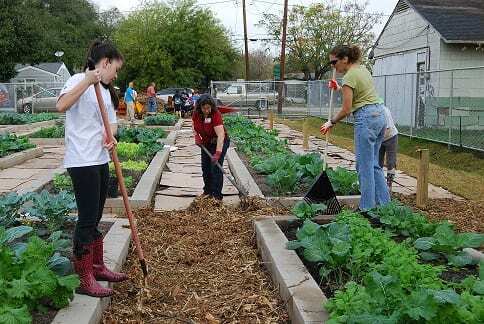 We then compared the Urban Harvest map has of their affiliate gardens with a Houston food desert map. Then we discussed what “sustainable” means for a garden; self-sustaining, productivity, and longevity were all measures we deemed to be important when determining if a community garden is successful. We were also able to talk to our community partner, Emily and identify our users, stakeholders and sub problem spaces. Communication between Urban Harvest and community gardens, and communication between community gardens and community members were seen as two different problem spaces. Stigma, leadership and volunteering were also relevant topics that came up. Ultimately, the biggest takeaway from our talk with Emily is Urban Harvest’s emphasis on 5 best practices that are key to a garden becoming sustainable. Therefore, our next step will be to visit community gardens and ask leaders and gardeners about their practices, their relationship with Urban Harvest and their goals for their respective gardens.